The top rods rose and fell in proportion and relationship to each other driven by the cams below. The furthest wall was drawn in to extend the sense of space and the zig-zag on the floor moved the floor space and took away the weight of the forms above. The installation was meant to occupy all the space to the four corners of the room and beyond. This work immediately preceded the performance/film work, ‘You Will, You Are, You Have’. ‘Tret’ (1965) was purchased by the Arts Council of England from Martin’s first one-man show, in Chelsea in 1968. 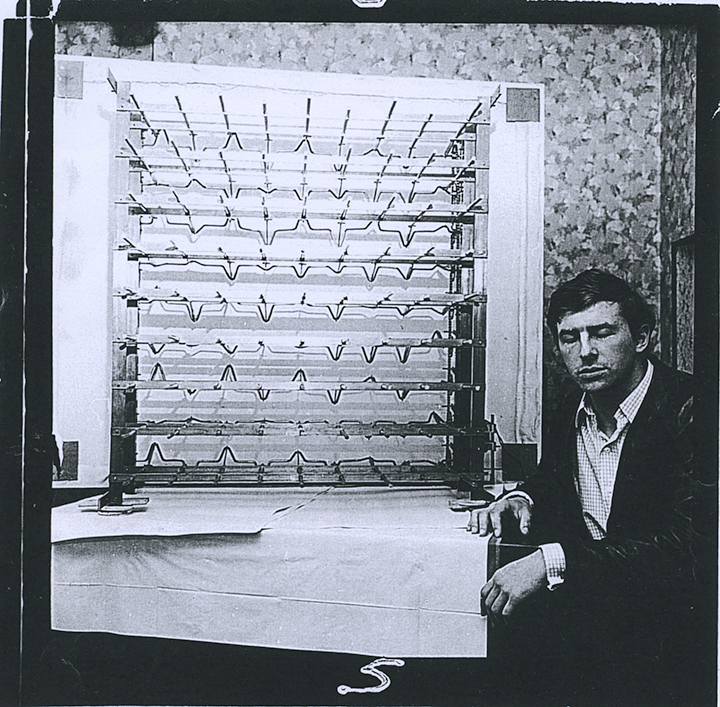 It was also shown at the Hayward Gallery exhibition Kinetics-International Survey in 1970. 81 Steel rods move very slowly in and out of the structure. Each is related to the next rod and to the overall proportion of extension of all the rods. The forward rings could move independently of the back rings. Each pair of rings could move separately from each other although they were mounted on the same axle. Statically developed shapes generate new classes of shapes and forms in movement. The aluminium shapes were thought of as fragments of space they inhabited. 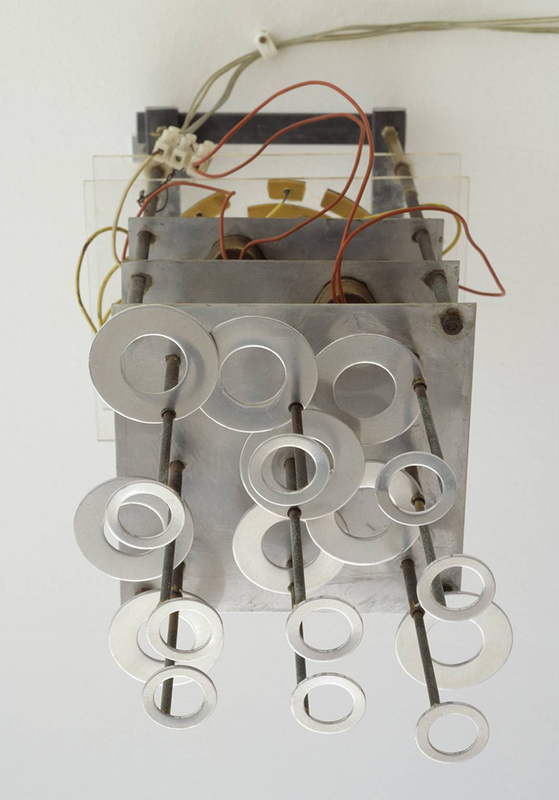 ‘Programmed Shape Development’ is a wall-mounted kinetic sculpture, made in polished aluminium, with double-axel discs mounted on metal rods projecting from the surface and four motors, one connecting to each quadrant of discs. The discs spin around, reflecting the light and the surrounding environment and creating complex optical effects in which the discs seem to share the same surface despite their staggered composition. Barry Martin wrote at the time: ’statically developed shapes generate new classes of shapes and forms in movement. Front and back shapes move independently from each other. 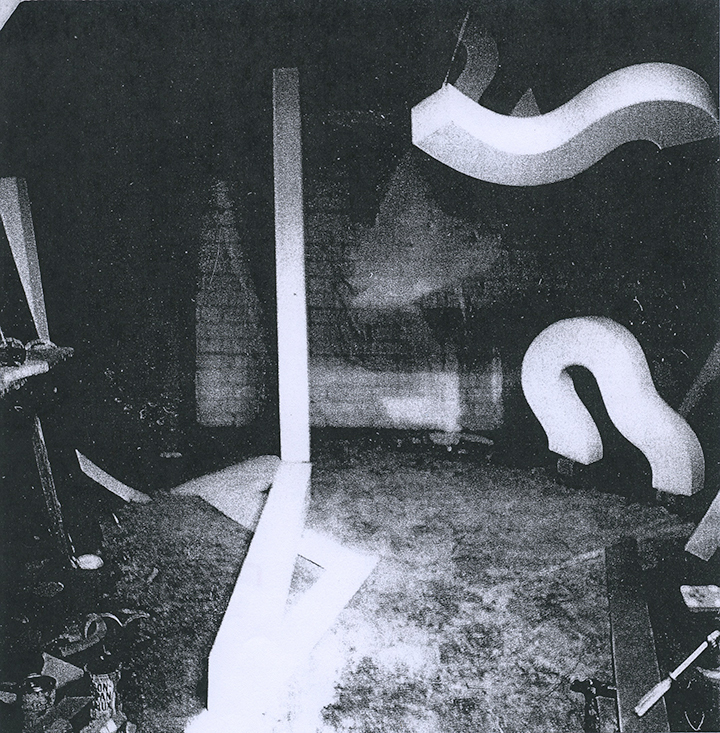 The aluminium shapes were thought of as fragments of the space they inhabited’. 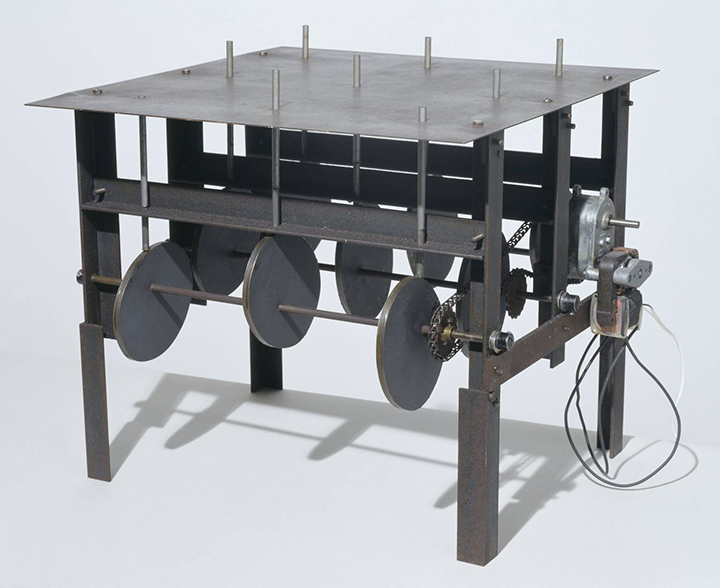 The circular or rotary movement is typical of Martin’s work of the 1960s - in a contemporary interview, he described his interpersonal relationships in terms of a circular movement between himself and the outside world. 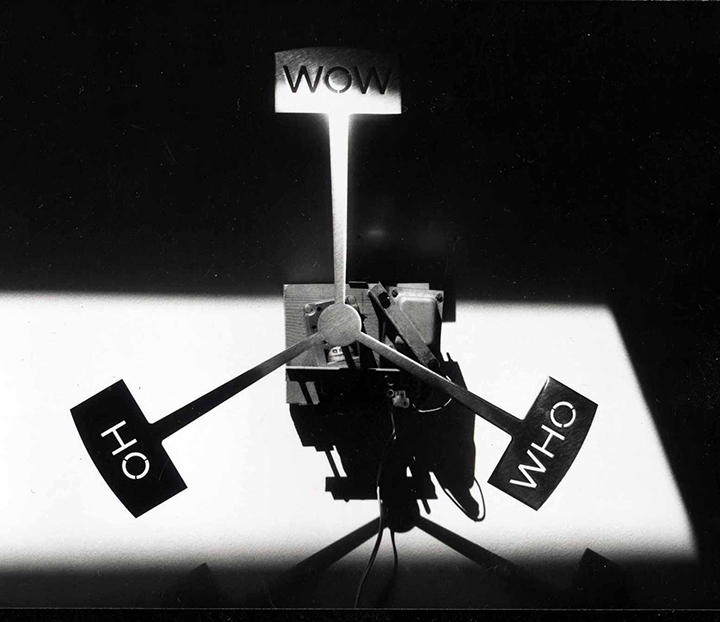 The machine was controlled by a simple computer device, and each lamp could alter its direction of throw, its speed and angle of inclination. They could also individually stop and start to alter the programme and composition of light structure. The lamps were orchestrated to interrelate their colour beams and overlap them onto the interior of the dome. It was hung 9’ above the floor. A version of this work is in the Science Museum Collection, London. This installation work was reviewed in various art magazines and newspapers and featured in several films made about the artist’s work. It provoked a number of performance variations and used light as an active space maker that was proactive. It superseded the notion of light as a secondary agent in environmental installations and was the first to do so in an art context. 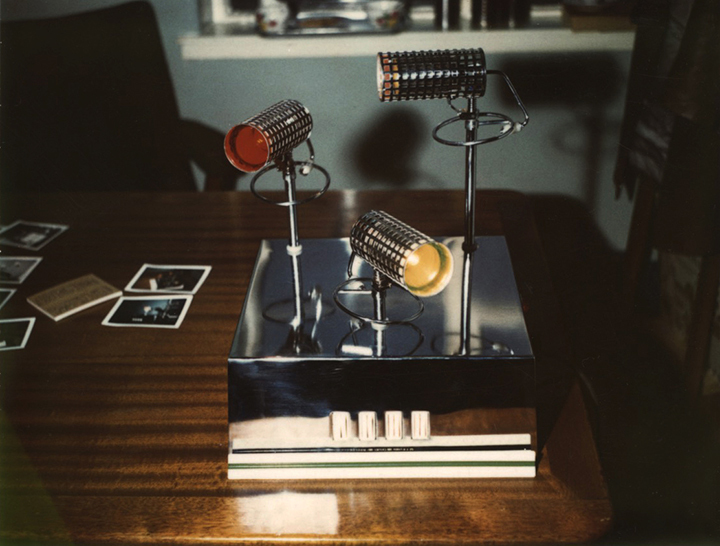 Martin’s invention consists of three coloured lamps supported on interlocking tubular axles rotating in different directions, as inner and outer tubes, the outer one having a ring and rod affixed to a lamp (a precise specification is given in the patent documentation). The machine gave unprecedented sensitivity and flexibility to the operator in directing coloured light. From the shop in Chelsea the artist, models and drawings swiftly travelled to Glasgow, to the factory of Andrew Chalmer, and thence to Her Majesty’s Patent Office. It was his first taste of the high life: flying monthly first-class to Scotland for business lunches, a brief meeting with the Scottish boffins and then straight back to London, the worse for champagne. But for all the patron’s investments, the Patented Light Machine made no one’s fortune and Martin remained a struggling artist. 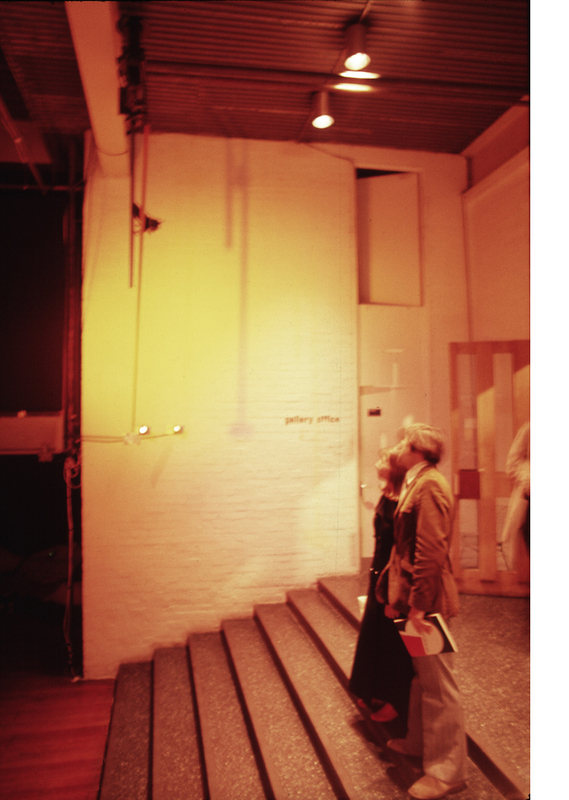 To make ends meet, he came closest to a commercial application of his light inventions by hiring out his Chelsea Pavilion piece to provide light shows at private parties in Chelsea, Mayfair and Belgravia between 1968 and 1970. The idea caught on and the enterprise took off, becoming part of a well-known mobile discotheque for London’s jeunesse dore, only without Martin. To this day he remains convinced that the world is the better for his disco light show, but laments ‘By now I should have a fleet of Rolls-Royces and a castle in every civilised country’. Photo-electric beams, 9 projecting coloured spot and flood lights, 500-2K watts, electromagnetic actuator. electric motor, steel, stepper motor and programmer. 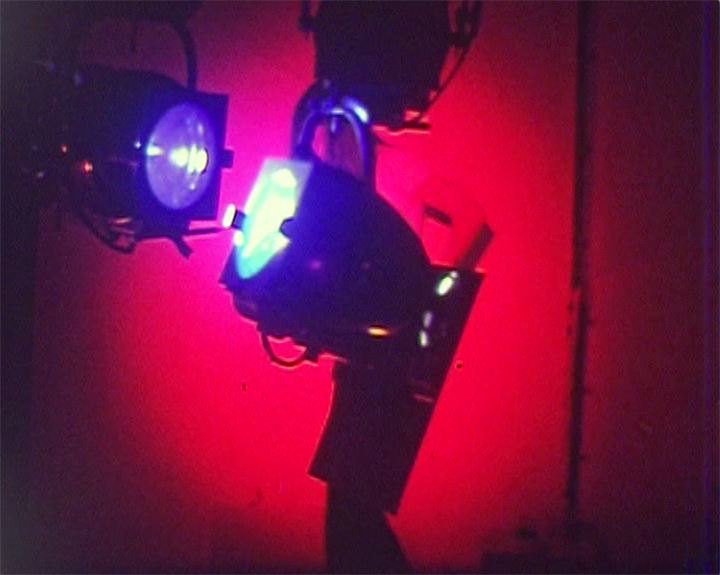 The position of the rod triggered two electro-photo beams that switched on or off the different individual coloured lights. The most dramatic example of Martin’s adventures in word art is his earliest. 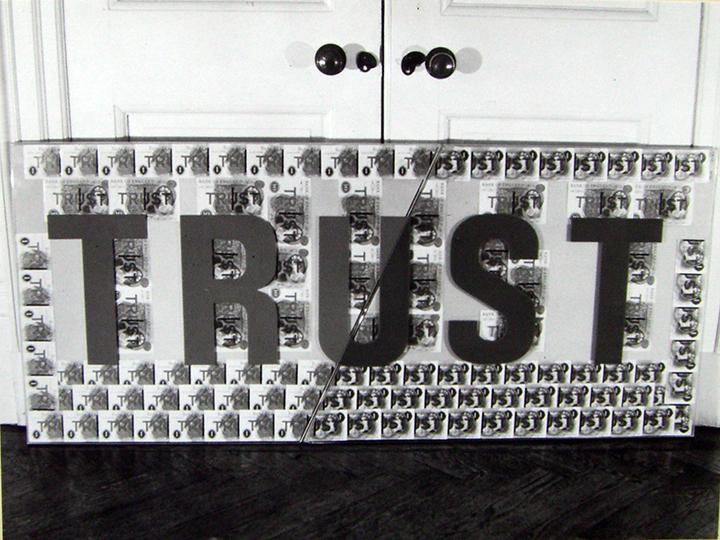 TRUST (1969, Private Collection) is certainly his biggest, and most costly, work in words to date. It sprung from almost tragic circumstances. In 1969 a mutual friend took Martin to visit an American supermodel in a private London hospital. There could be few more pitiful and poignant sights in Chelsea’s high society ‘swinging Sixties’ scene, than this tall beauty, her face so familiar from countless fashion magazines and catwalks, lying in a clinically-cold bed, her spirits broken by a failed romance, trying to recover from her attempt at suicide. Even at that she felt she had failed. Through the lens of a photographer such as David Bailey in her present state this broken swan could have symbolised the end of the decade. But that was not why Barry Martin was here, not to add to the art of her admirers but to help their mutual friend think of some way to restore her spirits. Rejected by her lover, she suffered the further indignity of being told, in his spiteful parting words, ’You’ll never be able to repay that loan’. He had lent her £3.500 (a sum equivalent at that time to several months’ earnings) and her career did indeed appear to be at an end. Martin was asked to come up with something special. TRUST was commissioned as a parting gift from the supermodel to her former lover, through the patronage of a friend who still prefers to remain anonymous. 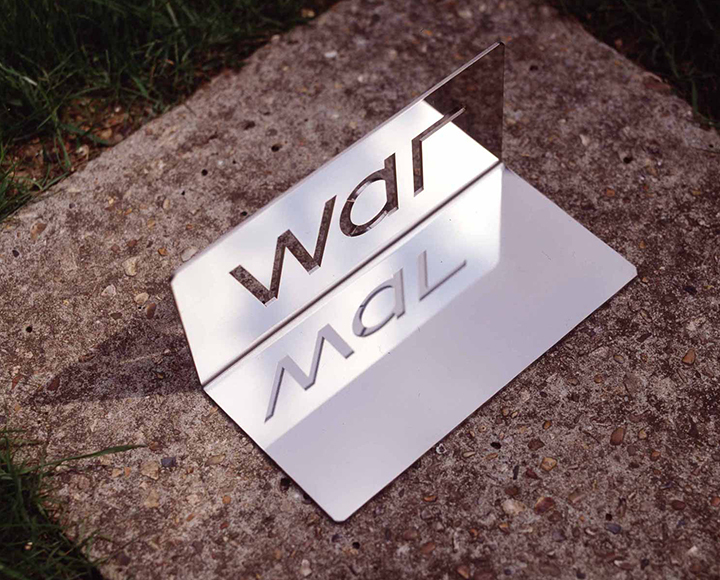 It consists of a six-foot long Perspex case, divided diagonally into two across the central letter U. Each letter was over a foot tall, made of coloured Perspex, the left side in blue, the right side in red. Framing the word, wads of genuine banknotes were arranged, totalling in value £3,500, each one silk-screened with the word TRUST to match the blue or red side of the case. On New Year’s Eve, as the 1960s began to melt into the 1970s, Martin and their mutual friend loaded the loaded message into a London taxi and sent it on its way, to a party hosted by the estranged lover. When it eventually arrived at its destination, a country house in Cornwall, and was unwrapped among bemused guests, TRUST made quite an awkward impression. The supermodel’s loan had been repaid, with interest. Unfortunately the celebrities’ story leaked out, into the national press. and Martin was falsely accused of cooking up a publicity stunt at others’ expense. Insulted and incensed, he has never asked what became of the work. But he learnt from the commission never to underestimate the power of a single word. As with all of Martin’s art, TRUST operated on several levels, and would repay close Inspection of the details, if it still exists. By overprinting actual banknotes, Martin raised the work from a personal exchange at the very end of a relationship to one addressing the mechanism that connects the modern world, indeed, the only internationally-shared belief system, the faith in money. The.actual value of the global economy depends upon a fragile human quality, of trust. The message is writ large in industrial Perspex, like a commercial road sign, but it is broken into two diagonally across the U, a simple pun that transforms a broad imperative into a personal question. Made in an edition of 20 in 1998 this small size work was intended to be sent to World Political Leaders and positioned on their desks as an aide memoire. There are a number of works in this series and in part are intended to enable the viewer, ‘to observe and reflect on the process of change itself,’ and, ‘Crossing thresholds of meaning at a glance creates mystery,’ as well as bringing self-questioning and self-examination to the fore. As the work slowly revolves clockwise the words change their meaning.